2014 Bowman Chrome football card of NFL running back Frank Gore, a soon to be 36 year old who recently signed to play his 15th season in the league for the Buffalo Bills. 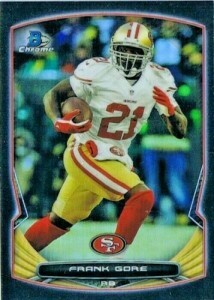 He had most of his success in his first 10 years in San Francisco with the 49ers, but has proven to be a durable back. A five-time Pro Bowler, Gore is fourth on the NFL’s list of all-time rushing leaders, and should be a lock for the Pro Football Hall of Fame when he decides to retire.